A number of terms have been defined for the purpose of identifying the stress at which plastic deformation begins. The value most commonly used for this purpose is the yield strength. The yield strength is defined as the stress at which a predetermined amount of permanent deformation occurs. The graphical portion of the early stages of a tension test is used to evaluate yield strength. To find yield strength, the predetermined amount of permanent strain is set along the strain axis of the graph, to the right of the origin (zero). It is indicated in Figure 5 as Point (D). A straight line is drawn through Point (D) at the same slope as the initial portion of the stress-strain curve. The point of intersection of the new line and the stressstrain curve is projected to the stress axis. The stress value, in pounds per square inch, is the yield strength. It is indicated in Figure 5 as Point 3. This method of plotting is done for the purpose of subtracting the elastic strain from the total strain, leaving the predetermined "permanent offset" as a remainder. When yield strength is reported, the amount of offset used in the determination should be stated. For example, "Yield Strength (at 0.2% offset) = 51,200 psi." Some examples of yield strength for metals are as follows. Alternate values are sometimes used instead of yield strength. Several of these are briefly described below. The yield point, determined by the divider method, involves an observer with a pair of dividers watching for visible elongation between two gage marks on the specimen. When visible stretch occurs, the load at that instant is recorded, and the stress corresponding to that load is calculated. Soft steel, when tested in tension, frequently displays a peculiar characteristic, known as a yield point. If the stress-strain curve is plotted, a drop in the load (or sometimes a constant load) is observed although the strain continues to increase. Eventually, the metal is strengthened by the deformation, and the load increases with further straining. The high point on the S-shaped portion of the curve, where yielding began, is known as the upper yield point, and the minimum point is the lower yield point. This phenomenon is very troublesome in certain deep drawing operations of sheet steel. The steel continues to elongate and to become thinner at local areas where the plastic strain initiates, leaving unsightly depressions called stretcher strains or "worms." The proportional limit is defined as the stress at which the stress-strain curve first deviates from a straight line. Below this limiting value of stress, the ratio of stress to strain is constant, and the material is said to obey Hooke's Law (stress is proportional to strain). The proportional limit usually is not used in specifications because the deviation begins so gradually that controversies are sure to arise as to the exact stress at which the line begins to curve. 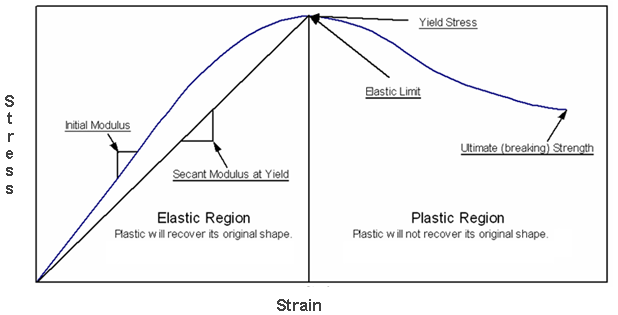 The elastic limit has previously been defined as the stress at which plastic deformation begins. This limit cannot be determined from the stress-strain curve. The method of determining the limit would have to include a succession of slightly increasing loads with intervening complete unloading for the detection of the first plastic deformation or "permanent set." Like the proportional limit, its determination would result in controversy. Elastic limit is used, however, as a descriptive, qualitative term.